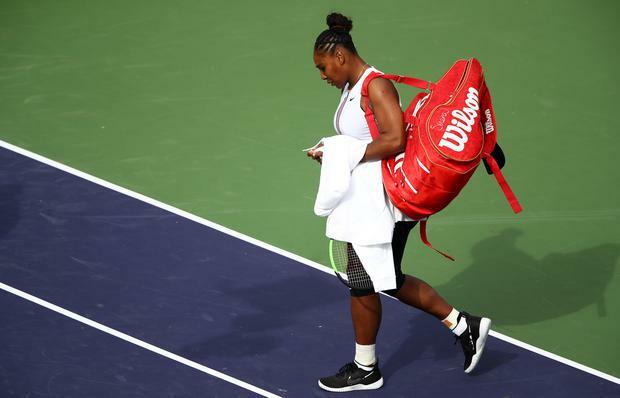 Serena Williams was forced to quit in the seocnd set of her match against Garbine Muguruza at the Indian Wells Masters event, after suggesting she was struggling to breath. Williams, who was suffering from the effects of a viral illness, started the match in encouraging fashion and raced into a 3-0 lead against two-time Grand Slam champion Muguruza, but it was clear she was struggling physically after losing the first set 6-3. After seeing the trainer and having her blood pressure tested, she continued the match until calling time after just one game of the second set. "I can't breath," stated Williams in her conversations with on-court medics, with her coach Patrick Mouratoglou encouraging her to quit the match before she finally conceded. "We've played many times and it's always super-tough, super-exciting," said former world No.1 Muguruza. "I wish I'm going to see her soon and she's feeling better." Williams left the court to warm applause, yet he ongoing fitness issues must be concerning the tennis legend who has struggled to hit top form since returning to the court following the birth of her first child last year. Paulina Duran A cartoon published in an Australian newspaper that depicted tennis star Serena Williams having a temper tantrum at the U.S. Open last year was not racist, Australia's media watchdog said on Monday.